Live zero commission baccarat, offered at Microgaming’s live casinos (picture left from Platinum Play) looks identical to their standard live baccarat game. And apart from one minor difference, the games really are largely the same. The difference is in the name. This game charges no house commission on Banker wins. 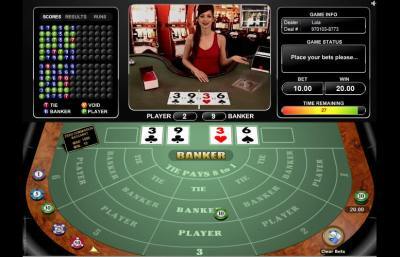 Most baccarat games apply a 5% house commission to the 1:1 payout for a Banker win. This commission is also known as the ‘Vigorish’. Now before yo get too excited and think this game gives you a nice return to player, there is one other difference that compensates for the zero commission. That is, when the Banker hand wins with a total of 8, it will only pay 1:2 rather than the standard 1:1. Effectively it’s a commission packaged in a slightly different way. I haven’t done the game maths on this one, so it may still be a high returning game. But make no mistake, there’s a pesky house edge in there for sure.